Observation - Dunnock - UK and Ireland. Description: Dunnock briefly perched just below bird table on our allotment, before a Robin that had got there first drove it off. The battle for feeding rights went on for about 20 minutes. 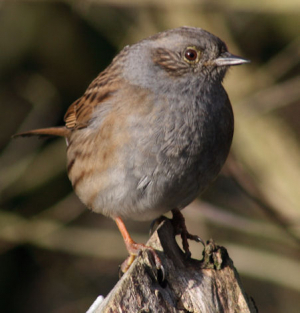 Dunnock briefly perched just below bird table on our allotment, before a Robin that had got there first drove it off. The battle for feeding rights went on for about 20 minutes.